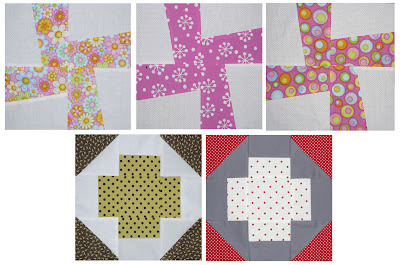 Patchy Work of Mini Grey: EB Quilter Bee Blocks! Its been slow sewing around here lately. Life is getting in the way of sitting down behind the machine! I have finally completed my blocks for the last two months of the EB Quilters Bee. I have realized that I am down for October, the last month, so I better start thinking about that I want the girls to sew for me! The whirlygigs are for Mands and the crosses are for Denni.Hope you like them ladies! Fun blocks! I love the whirlygig ones.